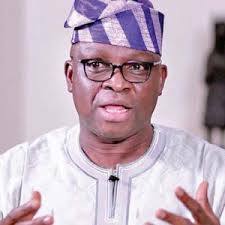 Ekiti State Governor, Chief Ayodele Fayose, has expressed concern over the suffering and hardship facing the Nigerian masses and called for well meaning leaders to salvage their precarious condition. He also lamented that the corporate existence of Nigeria was being threatened by selective administration of justice, marginalisation, and vendetta against perceived political opponents of President Muhammadu Buhari’s administration. This is just as he decried the level of poverty in the country, adding that many Nigerians are dying in silence with nobody standing up for them. Fayose, therefore, called on people of good conscience not to allow their voices to be silenced because of possible political antagonism or persecution. He spoke in Lagos on Friday night while being conferred with the award of Man of the Year by the Silverbird Group. In a statement by his Chief Press Secretary, Mr Idowu Adelusi, the governor was quoted as saying that the major step to take to solve the problem was in going back to the basics and restructuring the country. Fayose, who fielded questions from newsmen after the event, said he would not allow anybody to drown his voice or silence him no matter what it would cost. “A lot of people we know to be vocal have lost their voices. Some have taken cover under the beds of their wives. We are in a perilous time and I appreciate those who are still standing for the people at this time. For me, I will remain a man. Some people have kept quiet because they fear that they may be persecuted,” he said. “But should we all keep quiet when people are oppressed and suppressed and blatantly marginalised? Look at the level of poverty in the country, it is sickening. The standard of living has gone down. And how do we explain a situation where some people are treated as slaves and others as princes. This country belongs to all of us. It is in serious need now and we must salvage the situation,” he added. On the call for restructuring, Fayose said he aligned with the call made many years ago by the late Dim Emeka Odumegwu Ojukwu that the country must be restructured. He noted that the issues that led to the civil war were yet to be resolved many decades after. “I was moved by what the late Chief Ojukwu said many years ago and never knew his wife would be the one to present this award to me. We should go back to the basics or we are going nowhere. We are one and the same and no section must be marginalized,” Fayose posited. While charging leaders to make laws for the good of the people, adding that the law prohibiting open grazing in Ekiti State had come to stay. He said anybody who crosses the line would be dealt with. While presenting the award to Fayose, former Nigerian Ambassador to Spain, Mrs Bianca Ojukwu, described Fayose as an irrepressible governor of the people. Also speaking, the Chairman of the Silverbird Group, Senator Ben Murray-Bruce, said all the award winners were men and women who deserved to be so recognised.